Serious flying — Congressman Steve Knight receives an F-35 demonstration flight at the Lockheed Martin Skunk Works in Palmdale, Calif., with guidance from Jeff Nymoen. Knight joined Jack O’Banion, vice president, Strategy & Customer Requirements for Advanced Development Program, and Eric Van Camp, director, F-35 Business Development, to update community leaders on the progress of the F-35 aircraft and program. More than 3,100 F-35s are scheduled for production with each partner country contributing to the program. Living most of his life in the Antelope Valley, Knight personally knows the value of a strong military. 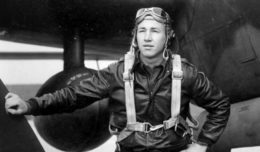 He has spent plenty of time with pilots and also served in the U.S. Army. He also serves on the House Committee on Armed Services. If pilots don’t like or believe in the product, they would tell him. More than 3,100 F-35s are scheduled for production, with each partner country contributing to the program. The United States, Australia, Italy, Netherlands, Norway and the United Kingdom have all received the first of their F-35s, and Israel and Japan will receive theirs later this year. Using the latest technology, Knight said the 5th generation fighter is performing as promised and thanked several aerospace partners in the audience for their contributions to the program, including Northrop Grumman. 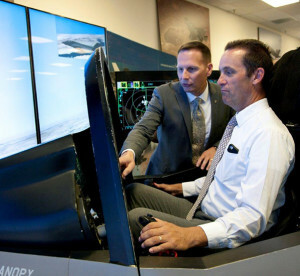 “The state of California is a very important part of the team manufacturing the F-35, with the program supporting nearly 22,000 direct and indirect jobs and creating an economic impact of $10 billion,” said Eric Van Camp, director, F-35 Business Development. The program is expected to continue through 2050.